I have very limited knowledge of Photoshop. I came to digital, holding on to my last roles of Kodachrome and Velvia, stubbornly. In 2006, I got an assignment to direct a film and shoot the photography as well. It was a quick learning curve and since I rely on Mac, I purchased their newly released Aperture program and learned it quickly. All of my adjustments are made on Aperture. I will often crop, use contrast to darken or highlight and image, or sharpen when necessary, and try to carefully minimize saturation, as most photographs I see seem to be over-the-top with “saturation-itis,” as I call it. After a while you become numb to such exaggerated coloring, so, I think, in most cases, less is better. I set my internal camera controls (5D & 7D) to a tad toward saturation, but just slightly for much of my color shooting. Overall, I make minor adjustments and prefer to do most of my work in camera. Sometimes, I will accent an image with a slight horizontal, or vertical shake. This was from a small pond in a rural Connecticut park. There was a log, half-in and half-out of the water, which I stood on and gently jumped up and down to create ripples. Then, I waited until they were almost gone and began shooting. I took over 200 images of this in a two-week period to finally find one that I was satisfied with using. Did a slight blue tint and slight green saturation, with sharpening and a touch of contrast. The image is also turned upside down as you view it. Had lost my battery for my 5D and was on an island, so I borrowed a Rebel TSi, with a standard 55 mm lens and took a walk seeking a photo op–not hard to find in Greece! This was a small bay on a remote island and I was standing on the edge of a sea wall. I waited for the lady (wearing sneakers to protect herself from sea urchins) to swim toward the middle of my frame and into the light blue waters, then grabbed my image. I was surprised, and pleased, at the Rebel’s quality. Did slight saturation and some sharpening. 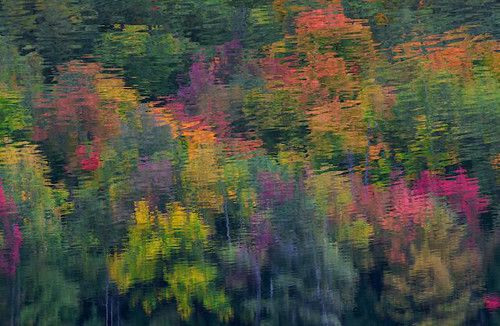 This image is one of my most popular and sells very well at several East Coast galleries. This is one of my favorite. I had the model leap over 20 times to get this shot so that itwas not too high, not too low. Her movement, combined with a 1/20 second TV and a very colorful lose wrap skirt conspired for some nice blur. I cloned some of the sand to get some of her footprints out toward the bottom, otherwise, a tinge of added blue saturation, a touch of yellow, very light sharpening and straightening. My mother was a painter, but I have two left hands with brushes, so I’ve tried to create a painterly effect with my camera, with its speeds and my subjects movement. 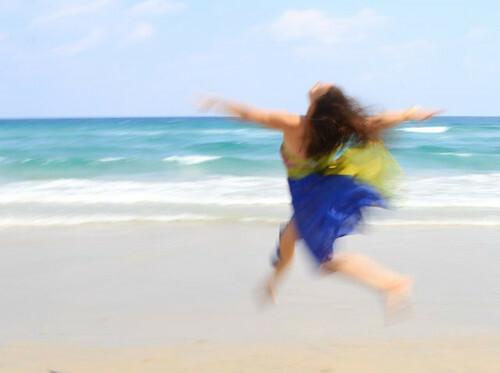 With a bit of dance background myself, I told her I wanted elevated poise with straight arms and face toward the heavens. She nailed it. 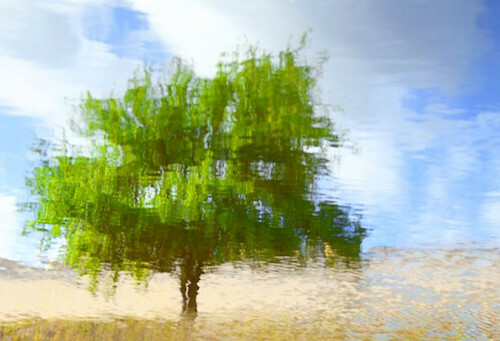 You are looking at a tree that is really reversed in position as it is a water reflection that I turned upside down in Aperture to create a painterly effect. One of my secrets is to carry very small rocks in my pocket and strategically toss them into the middle of my focus and wait for the effect I want. Bigger rocks will give you more abstract images. Added light saturation of green and blue with slight sharpening and cropping. This was taken toward the beginning of fall this year. 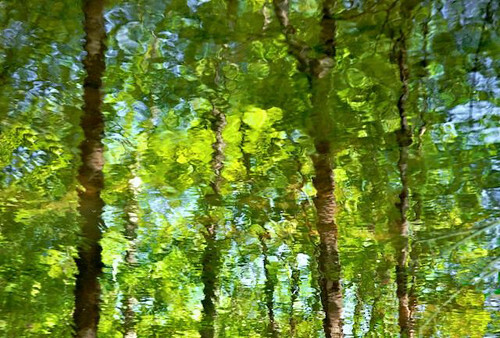 You are looking at a lake reflection that is turned upside down to appear as if they are upright trees. The wind did the water movement for me, so that was a stroke of luck. I was looking to take another picture, but as it usually works out, I realized that my real picture was opposite that direction. This was it. In addition to this, I did a very subtle horizontal movement with my camera, almost too subtle to notice. Sharpening, slight saturation (the leaves were really purple!) and a bit of contrast, as the setting sun offered a fading glare. This was a simple bush along the road side of a remote mountain road. My focus was aided by a slight intentional camera shake, sharpening, a bit of red, green and purple saturation with slight contrast. 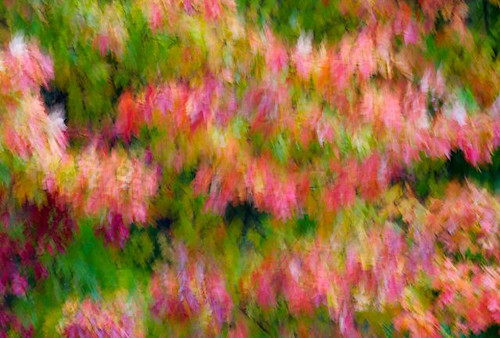 A London photo critic called this image, “Monet Lives” – it was the nicest compliment I ever got photographically. 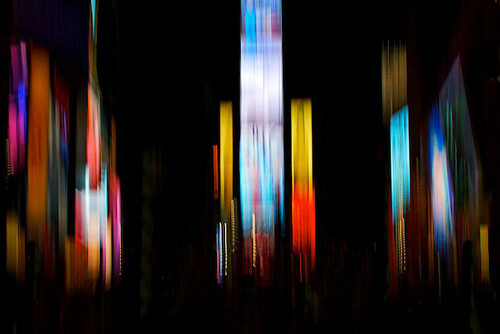 One of my favorite sites for light abstracts if, of course, 42md street. I watched these lights constantly change and patiently waited until I understood their pattern. Ideally, you want to photograph as little white as possible–other colors just offer more visual appeal than stark white. This image was done with slight vertical camera shake, very slight, and in a straight vertical line. In Aperture processing, the most important tool for me here was the darkening tool. That allowed all miscellaneous squiggly lines to disappear. I removed with black cloning some of the upper squiggly ones just to get a clean image and sharpened slightly. A touch of saturation, and black cloning on the bottom. I really love these shots, the fluidity is mesmerizing. Trees water view is really awesome.Great combination of two natural resources.Stunning pics. Wow beautiful shots, you make it sound very easy to pull these off but I know it takes a true talent to visualize and then make them come to life with such vivid color and expression. Congrats and Merry Christmas. The idea behind these pics is beyond imagination.I can see the passion of photographer about profession.Fully dedication job done. There are lots of digital camera’s out there in market,but I personally believe that technology of Canon,Sony and Nikon are way ahead as compare to other companies.Most of the people prefer these. I like the last photo…the contrast is really cool. 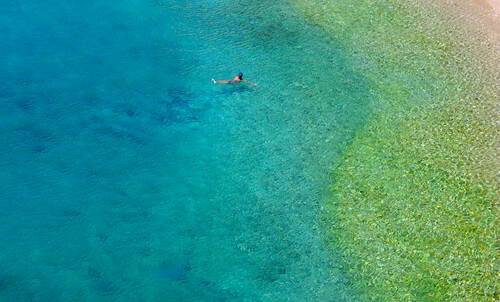 Excellent photography,images looking under water completely natural.The idea behind is great. to other companies.Most of the people prefer these. and just go around snapping everything you see. The Image are looking blurred.Is it an art or there is problem while capturing them.. Images with watery effect looking very nice. Great piece of work done.